As if my obsession with all things coral has not been stated enough on this blog, I've been looking for the perfect coral polish lately. The other day I picked up three potential candidates: Melon of Troy, Hot & Spicy, and Conga-Line Coral. I don't exactly know what I was thinking when I picked up these polishes, because I'm a creme finish girl. I really hate frosty and overly shimmery polishes, which the last two happen to be. Um, I obviously wasn't thinking. Hot & Spicy was released with the Hong Kong collection last year, and really is a beautiful colour. The camera made the colour way more orange than it is in real life. Looking at the bottle and my nails, the colour leans more pink - it's actually really nice! But once in bright light, it looks almost neon, so unfortunately it doesn't pass as the perfect coral. Melon of Troy on the other hand is almost the shade I'm looking for - minus the frosty finish. Ugh, I honestly cannot rant more about how much I hate frosted polishes! I hate being able to see the dragged lines through the polish, and it doesn't give the same quality of shine as a creme does.. boo hoo. Anyone have a good coral polish recommendation? Let me know! The Essie and Innoxa are creams, and I just find each time I trie them on that cream corals look a little like orange tippex on the nails! hate it! ELF is my favorite because it's a little shimmery (tiny golden sparkles), but that won't suit you. Thanks for your suggestions! 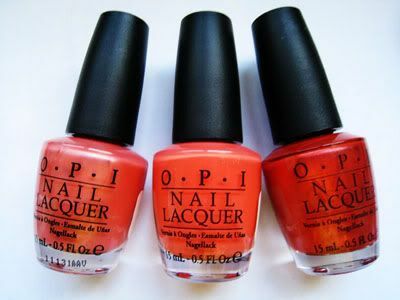 I will definitely take a look into them - I think my favourite coral right now would be Essie's Tarte Deco!